Rice and lentils are two of my favorite foods, but I love them even more when they’re paired together. I was on a Mejadra kick the last few weeks and loved every bite. Mejadra is a Middle Eastern-Mediterranean dish of rice and lentils cooked with warming spices (not spicy) and topped with fried onions. I tried two recipes recently, one by Ottolenghi and one in the new Staub cookbook. The Staub recipe was by far my favorite. I made Mejadra for Rosh Hashana lunch and to break the fast on Yom Kippur. Both times I was trying to accommodate the vegans in the group (I served the yogurt on the side), but everyone dug into it and enjoyed it so much. I was worried there wasn’t going to be leftovers for me, so I snuck some into a container so I could eat it a few days later. 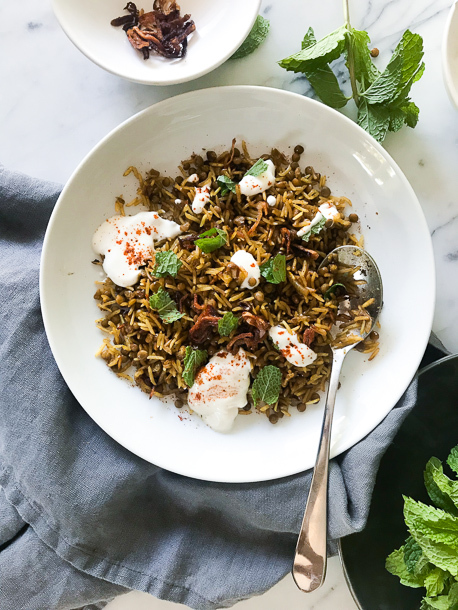 Mejadra is one of those easy, flavorful, hearty dishes that should be in every rice-and-legume-eater’s back pocket. It goes with anything and everything and the leftovers reheat beautifully on their own, with a fried egg on top, with avocado, with a basic salad, or with some stock and turned into a soup. I didn’t follow this recipe exactly – I used mint instead of chervil leaves and I pan-fried my own shallots, as opposed to buying them already fried in a can. Or just saute onions and stir those in. Plus, I do have a Staub cast iron cocotte, which I LOVE, but you can use a regular old pot and I am sure it will taste just as delish. Speaking of Staub, their cookbook authored by my friend Amanda Frederickson, is gorgeous with a capital G. It’s not a book focused on uber healthful foods, mind you. The dessert section doesn’t stay away from sugar, for example. But let me tell you, I want to make and eat everything in this book! Chicken meatballs in red coconut curry sauce; toasty honey corn loaf; pumpkin, bacon and kale gratin; spiced chocolate fondue! 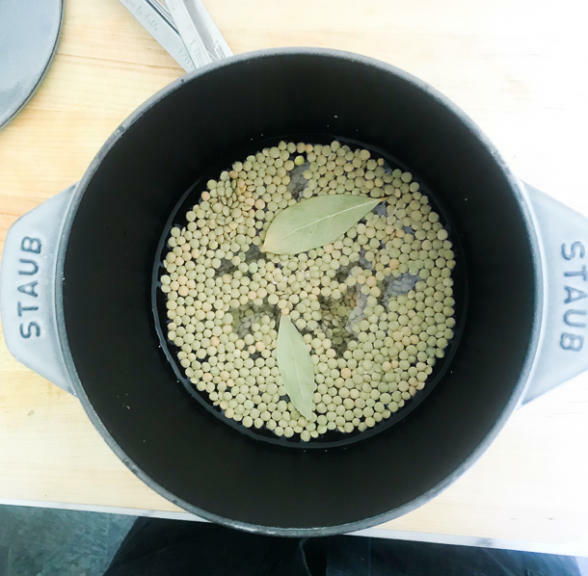 Put the lentils in a cast-iron petite French oven, add water to cover, then add the bay leaves and salt. Place over medium heat, bring to a low boil and boil for 12 to 15 minutes, until the lentils have softened but still have a little bite. Drain reserving ¾ cup of the cooking water. Heat the oil in a 4-quart cast-iron cocotte and add the onion. Cook over medium heat, stirring occasionally, until the onion takes on a golden brown color. Add the turmeric, allspice, cinnamon, and sugar and cook for 30 seconds. Add the rice and stir to coat. Add the cooked lentils and reserved lentil stock and bring to a boil. Reduce the heat to very low, cover, and simmer for 11 minutes. Remove from the heat and cover the pot with a clean, dry tea towel. Seal tightly with the lid and set aside for 10 minutes to let the rice rest and absorb all the flavors. 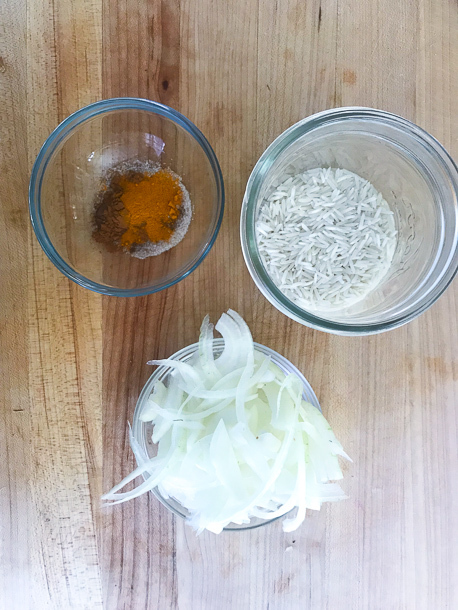 Serve the rice topped with yogurt, crispy shallots, a sprinkle of cayenne, and herbs. I love this recipe however when I attempted to double it, it did not come out as well. The basmati rice was undercooked but keeping it on the stove longer resulted in lentils that were too mushy. Do you have any suggestions if you are trying to make this for a crowd? Thank you! I’m sorry you didn’t have success when you doubled it. Tell me please, You used white basmati rice, correct? Did you also double the liquid? What about the size saucepan you used? If you doubled the liquid, it sounds like you used a pot that was too big. Let me know! I used white basmati rice and doubled the liquid, but I did use a 5qt dutch oven that was probably too big. What size pot do you recommend for the recipe as is and what size pot when doubled? Thank you!! My husband still said this was the best rice he has ever had! Oh yes. 5 quart is much too big. I would recommend a 2-quart saucepan if doubling the recipe, max 3 quart. For a single, a 1 or 1 1/2 quart is perfectly fine. CanI make this with brown rice? How would you adjust the cooking time? I’m sure you could. I would cook everything together at the same time in a covered pot – lentils, rice, spices. Saute onions separately. I would try 2 1/3 cups water, cook for 40-45 until the rice is tender and allow to sit off the heat for 10, covered. Let me know how it turns out! Funny, because that’s what I serve for Rosh Hashanah lunch. I love it’s earthy quality. Feels like home. I will try this version now, as the only one I knew was Ottolenghis.